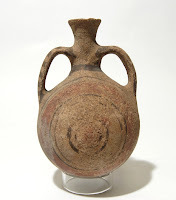 The Phoenician bichrome jugs are baseless and circular shaped. They are characterized by their red and black stripe decorations. The red stripes are broad while the black stripes are narrower. They also display a bump below the handle. At a later stage in the Iron Age IA these jars are covered with a red slip.